Today is a day when we in Canada when we are supposed to have a national discussion about mental health – sponsored by our biggest telecom, Bell Canada. I am no expert on mental health generally or living with anxiety specifically. I can say supportive things like I understand and listen, but I have never experienced any significant mental health challenges myself and do not truly understand what it is like to have a mental health issue. My wife Laura on the other hand lives with and within anxiety. It comes and goes in terms of intensity, but it is always there. So I asked her if she would like to take this space today to write and share her reality. I am grateful that she accepted and has shared below. Anxiety is hard to explain. It is hard to understand, hard to put into words. It is hard to talk about, in more than a casual, almost flippant way – to really talk about my anxiety makes me anxious. Anxiety for me is stomach aches. It is all of my introversion and sensitivity working against me, as well being things that I love about myself. It is worrying about getting somewhere on time the day before I need to be there, the painstaking way I pay attention to details about myself and my behaviour so that I am “right” and “fit in”, trying to be true to myself and also not stand out in case I am wrong. I am lucky and have a lot in life to be thankful for. Anxiety makes me feel guilty that I might not appreciate that enough. I have a long hoped-for baby, our third child, and I worry that I am not getting the most out of every day with her. 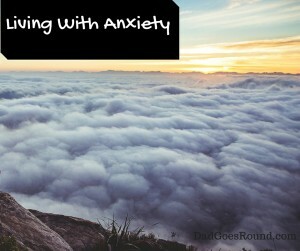 Anxiety is like a smokescreen, colouring everything and making it harder to see clearly. I have a Master’s degree in Drama, I can teach 40 primary students to sing together and then conduct them in front of the school, parents, teachers, friends and classmates. I can lead groups large and small, of all ages, teaching, singing, acting and communicating. But anxiety prevents me from asking for a solo in choir, or from getting it perfect when I have the chance. It prevents me from standing up and saying something when a friend, in conversation about their relative, says, “I mean, I understand the depression, but there is depression and then there is reality,” suggesting that the relative should just stop feeling so sad and get on with life and not be lazy. It means that although I love to have close friends over for a gathering, I feel anxious the whole day and evening of the party, worrying that I won’t do it right and that people won’t have fun. It means that I hide the depth of my emotions because I don’t want to draw undue attention to myself, for people to think I am “too” happy, or sad, or that I need to “calm down”, or “cheer up”, or “let it go.” Anxiety means that I have a hard time making choices – surely there is a wrong one and a right one – and it is hard to go with the flow, and not be in control, and let things just unfold. Anxiety makes me worry about writing this – I don’t want to share too much, or let down my guard, or hurt anyone’s feelings. I feel anxious that someone might worry about me. I don’t want to make anyone feel bad. Anxiety makes me exhausted. It makes me discouraged. It makes me cry. I am lucky to have a husband who is excellent at going with the flow, and who tries to understand, and who supports me as best he can. I have a therapist whom I really trust, who listens to me and gives me a different perspective, and some good friends who listen and support and encourage. I know who I am without this anxiety – for six years, after the birth of our first child, I took an anti-anxiety medication that worked brilliantly. I was the me who I always knew I was, underneath all of this worry. Then, side effects started cropping up, and they became untenable, and the search for a new medication began. I didn’t know how hard it would be! Two years, at least six medications, lots of side effects (because being highly sensitive, in my case, includes highly sensitive to medication it turns out), and still we have not found the “right” drug or combination. And I am afraid that I will not see that girl again, the one who is inside me and who can shine so much more brightly than I do right now. I am afraid that at the end of my life, I will look back and think, what a shame that I lost so much time being anxious. So much time, wasted with this smokescreen obscuring my life. I know how I can be, how I can feel, how I can live, and I want to find that again. So I keep trying, and some days are hard and some days I catch glimpses of that other me. And I try to do all the things you’re supposed to do to boost your mood, and sometimes I am successful. But I want you to know that anxiety is hard. And I am ok. But it is hard. Sendings hugs your way … great job on the post!